I took this picture back in 2005 (as you can see from the photo – I know I’m lazy, I should photoshop that out), and for the life of me I can’t remember the name of those birds nor where I took the photo. I know it is north of Auckland, New Zealand. On the coast, obviously. But that’s about it. What is she called? 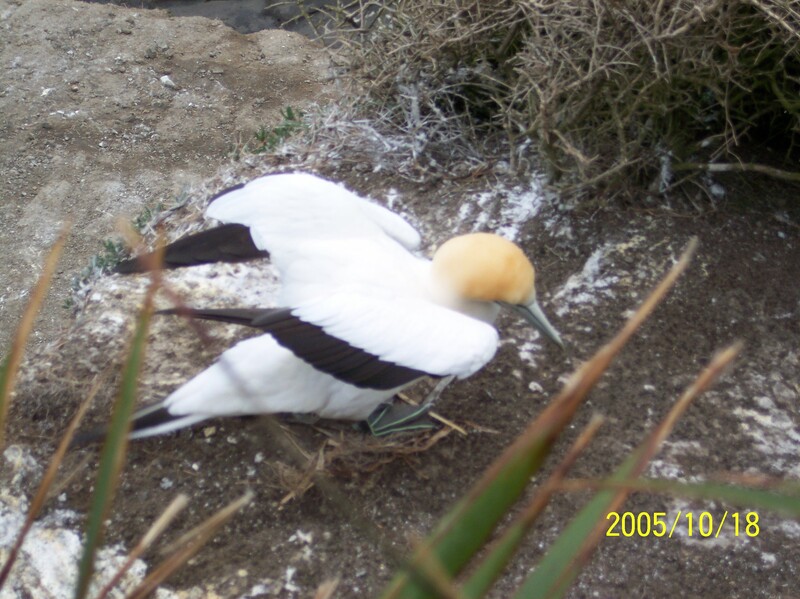 White body, orange capped head, black, webbed feet with bright green ribbing (see photo below), and those starling, blue-rimmed eyes. Do you know my name? White body with black-tipped wings, orange capped head, black, webbed feet with bright green ribbing, and starling, blue-rimmed eyes (see photo above). I could just ask my mother-in-law, but then that would be too easy. a nice dotted triangle, for sure birds are good designers and performance artists! I think those actually are masked boobys. I tried to find an image to be absolutely sure, but all google does is send me to ads. 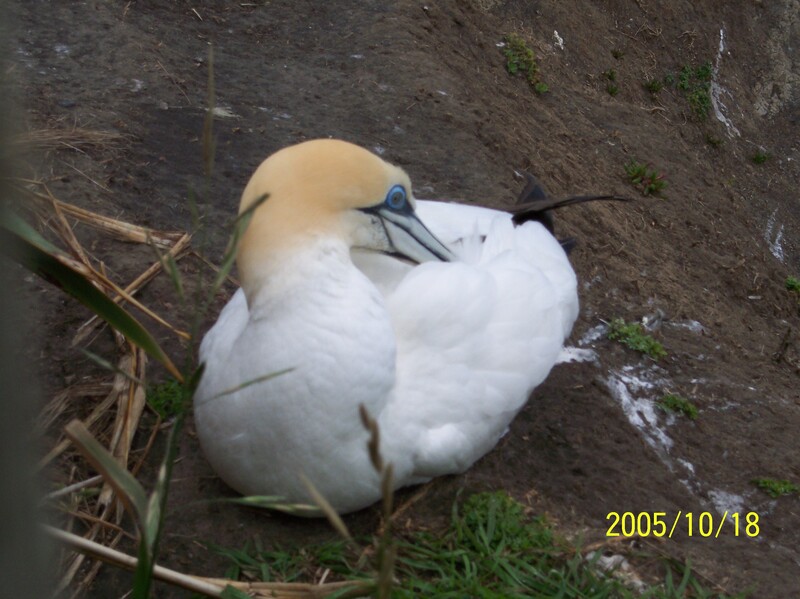 Might be a gannet, though. Those are great pics. Great image! 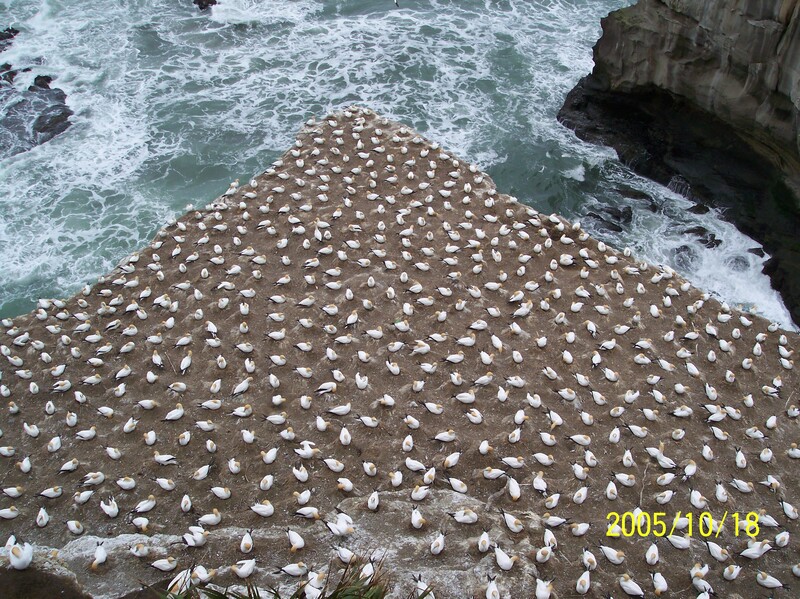 At first glance I thought this was of a bunch of small, white shells on a nearby rock. Then I refocused and became aware of the correct distance and saw the birds! Great shot! So funny how they seem to keep this strict distance from each other. So you’ve been to New Zealand many times, then? I remember you went quite recently (last year?). It’s THE one country I want to visit and go hiking/traveling about in. I’ve been there three times, each for about two months. My husband is from New Zealand and all his family is there. We should go more often.